Brokers are able to access ACAManager through a single sign-on solution (SSO) via benefitsCONNECT® and bCEnroll. Click on the ACAManager link, this will direct you to the ACAManager portal. Log onto ACAManager using the same user ID and password as you use for benefitsCONNECT. 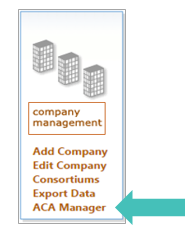 TIP: Employers access ACAManager via the direct ACAManager link. Notification will be distributed once the single sign-on solution for Employers has been implemented.